Getting into video marketing is super exciting. 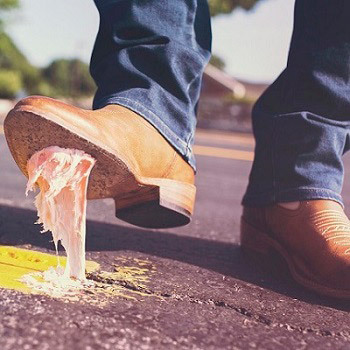 But when you're planning video content as part of your marketing for the first time (or even if you've been doing it for a while), it can be difficult to spot the common pitfalls you may be in danger of falling into. Nobody wants to invest lots of time and money into a video project only to make a rookie mistake. The good thing is, once you're aware of the biggest mistakes made in corporate video, all it takes is a little forethought to avoid them. To help you out here's a list of the 9 most common video marketing mistakes, and how you can neatly sidestep them in your own videos. It might sound obvious, but before you can create any kind of successful video you first need to know exactly what you want to achieve. Sometimes video can be such an exciting new medium that businesses jump in headfirst without considering what their real goal is, beyond "we want a video on our homepage!". Your video content — and what you want from it — should be carefully considered in relation to your wider business aims and current content marketing strategy. If you want to increase conversion rates, what kind of videos will work best? If you're looking for brand awareness, how will video best serve that aim? Keep in mind your broader goals and remember that video isn't the right medium for every job. Don't make video just for the sake of it. Instead, identify a problem you want to fix or a goal you want to achieve with video — and then turn it into a SMART objective. It could be getting 50% more visitors to sign up for a free trial of your software. Or it could be upselling to 10% of exisiting customers. Download our video objectives template for help with this. Once you have a clear objective you'll know where you want to head with your video content, and you'll have more guidance on how to get there. You can't make a single video and then tick off 'video marketing' from your to-do list. Just like any other kind of marketing, video content marketing doesn't work that way. No, you'll get a lot more from video as a powerful marketing tool if you see it as a long-term strategic committment rather than a one-off. One video isn't likely to achieve much. But a series of multiple videos, planned over an extended period time to hit a number of goals and support several areas of your business strategy, has much better odds. 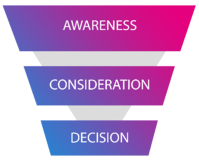 We recommend creating a funnel of video content all the way from the awareness to consideration to decision stages of the buyer's funnel. This way, you'll provide the information your leads are looking for on the path to sale and encourage them to keep moving along it. Plan a full strategy for your video content, including the objectives you'll aim for, the types of content you'll create, and how and where they will be used. 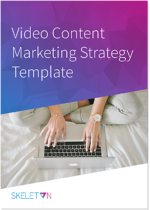 Download our video strategy template for a free resource to help you plan out this more strategic approach to video marketing. When you're right in the middle of video marketing you might be tempted to create the kind of content you'd like to watch. But you must never lose sight of the fact that you're making video for your audience, not yourself. As soon as they start watching, your viewers are asking themselves: what's in it for me? It's your job to offer something interesting to your audience — something that grabs them and holds onto their attention. That speaks to their cares and concerns. That they genuinely want to watch. Always create videos based on your understanding of your target audience, their needs and interests, and the problems they face that you can help alleviate. First of all, you'll need to make sure you've identified your target audience. If your information on them is a little spotty, conduct research into them to fill in gaps. It's valuable to know what kinds of video they already like watching and the common problems they face. Next, use that information to build a funnel of video content to appeal to your audience and answer their questions (see above). Finally, when creating the messaging and creative concepts behind your videos (read more about this below), make sure everything is tailored to appeal to that audience. The best, clearest and most memorable videos generally have a single message. The more messaging your video content contains, the higher risk of it becoming overly complex and confusing. That's why we recommended you focus on just one message in each video. Sometimes it's unavoidable that you'll need to have a couple, but try to avoid any more than two. If you've created a clear video funnel throughout the buyer's journey (see mistake number 2) then each video you make should have a specific goal and reason to exist. 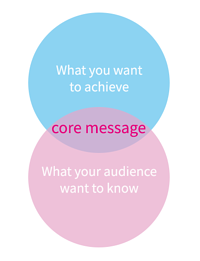 It shouldn't need any more than a single message to communicate the necessary information to your audience. Plus, video content that isn't message-rammed benefits by being shorter, less muddy, easier to follow and more enjoyable for your target audience. Based on your objective and your target audience, consider what you want each video you create to say to your audience. Boil this down into one or two core messages that are most vital to what you want to achieve. A single video can't get across every message or solve every problem. If you're wanting to express too much in one video, consider cutting it into multiple videos each with a single message instead. You may know your objective, your target audience and your message, but that still doesn't mean you're ready to create a video yet. In fact if you skip ahead at this stage you'll end up with video content that's boring, samey and unexciting. Why? Because it won't have a creative approach. This is basically the central idea that any video rests on, which supports your message and is tailored to your audience. It will inform the script, the filming style, the editing, the music and more — turning your video from bland and disconnected to powerfully focused. For example, the creative concept behind the Dollar Shave Club video (as if you need an excuse to watch it again) is: watch a business founder as he gives a comedically bad tour of his factory and convinces the audience to buy his razor blades. Don't rush straight into production. Spend some time hashing out ideas and settle on a creative concept for your video ("going viral" is not a valid approach) that's based on your audience and your core message. Keep in mind this creative approach during the production phase of your video content, and use it ensure all parts of your video are in alignment. Remember your video objective? If you've got a goal you need to achieve then you probably want your target audience to do something after watching your video, which means you'll want to include a Call-to-Action (CTA). This is something a surprising number of businesses forget to do. The fact is, your audience can't read your mind. Unless you explicitly tell them with a CTA, they won't know that you want them to take further action — whether that's filling in a form or sharing your video with their friends. Without this vital part of video marketing, viewers won't have a clear next step after watching. Instead of learning more about your offering and progressing down the marketing funnel they'll be aimless, either taking whatever action they feel like or — more likely — doing nothing at all. A CTA can range from something as simple as a voiceover asking viewers to like and subscribe, to a clickable link at the end of your video leading viewers to a landing page. Always include a CTA in your videos if it will help you achieve your objective. Remember to make it relevant to the content of the video itself, clear and persuasive. The process of creating video content is pretty complicated. You need to decide how that process will work — will you handle it all in-house, or are you going to outsource to a video partner? If you don't already have an in-house team, video marketing is a potentially overwhelming place to begin one. In this case it's a good idea to work with an external video agency that you like and trust. Don't assume you'll be able to handle everything within your own team, especially if you're new to video: it can quickly get unmanageable. Instead, think realistically about the best way to bring video marketing to your business or brand, whether that's internally or externally. Scope out some video agencies you like and decide on your favourite. Speak to them and see what they suggest for the implementation of your video marketing strategy. Decide whether you want your videos to be made in-house, externally, or a combination of the two. We recommend not biting off more than you can chew to begin with — you can always take on more responsibility for producing your own video content over time if you want. Just like any other form of content, video needs a good marketing or distribution strategy behind it to be successful. You need to plan for how you'll spread the reach of your video content and get it in front of your target audience. Plus, each platform, whether offline or online, has its own rules when it comes to video that you'll have to consider during production. For example, if you place your video on Facebook then remember that some viewers may watch it without audio and consider ways to encourage them to share. If you're placing your video on TV you'll need to produce a short, high-quality advert and plan out your ad spend budget. And if your video will sit on your website, consider on which page visitors will want to see that information and correctly implement video SEO. Many businesses seem to think they can put their newly created video content on YouTube and call it a day. Your distribution strategy doesn't need to be complex, but it does need to be there. Make sure your video content is tailored to how and where it will be marketed. Create the right kind of videos for the platforms you'll be using. And most importantly, build a real strategy for how you aim to reach your target audience with your video, whether that's through email, SEO, social media, influencer marketing or advertising. Base your decisions on where your target audience already spend their time and what's worked in the past. Then execute that strategy. There's a great feeling of relief that comes once your marketing strategy is set up and your video content is live. However, there's still one big mistake you need to avoid — failing to use video metrics to track the success of your content and get better in tthe future. After all, how are you going to know if you achieved your objectives or not without keeping track of data? You definitely need to monitor your analytics once your videos are live, not just to measure your success but also so you can constantly improve your future video marketing efforts. Without assessing how close you were to hitting your goals, or how far you overshot them, you'll never be able to learn what went well and what to emulate again. Make sure you're all set to track the right video metrics for your objective before your content goes live. Monitor your videos once they start getting views, and take the time to think critically about why you got the results you did so you can learn from their performance. Read our guide to video metrics to find out exactly which ones you should be tracking and why. Those were 9 shockingly common video marketing mistakes and how to avoid them. Almost all of these errors can be prevented by creating a thorough strategy (aka. a plan) for how your video content will be created, used and distributed. Download our video strategy template to create your own and avoid these mistakes in your upcoming video projects.